Outlaw Motorized Bicycles is a small family Owned business operated by Dougie Lloyd and his wife Angela Valentine-Lloyd in Huntington West Virginia. Outlaw Motorized Bicycles was founded and established in 2017 mainly to build better top quality motorized bicycles, and offer top quality parts and accessories for motorized bicycles. After buying 4 different motorized bicycles from other motorized bicycle builders in the Huntington West Virginia area since 2014, and having problem after problem with these motorized bicycles and learning through trial and error how to make these bicycles more reliable and safer, Our Co-Founder/Owner Dougie Lloyd decided to start his own business and partner with different companies like Bike Berry, Bicycle-Engines.com, and Bicycle Motor Works, just to name a few to get the best quality engine kits and other parts needed to start building better quality motorized bicycles that he felt would be more dependable and safer than the cheaper bikes he had purchased that had been built in our area from other motorized bicycle builders. 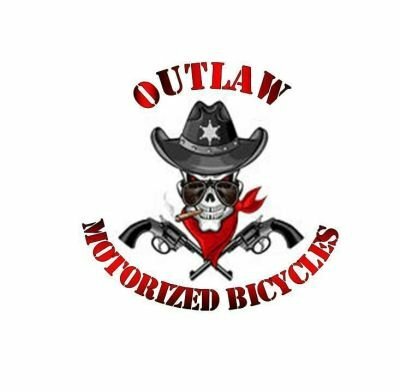 Outlaw Motorized Bicycles Builds, Services and Sells Motorized Bicycles & Sells Top Quality Parts and Accessories Online. Our Motorized Bicycles are built with only the best products that we can find and use to ensure our bicycles are durable and safe using mostly Disc Brake setups for better stopping ability. Feel free to contact us and we will be happy to build you a custom motorized bicycle, or you can purchase them directly from us as we get our builds completed.